If it’s time to buy a new mattress, you’re probably excited about all the options. 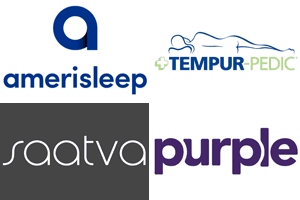 Just 10 years ago you would have only had a few major companies to choose from, but now there are hundreds of mattress manufacturers available for you to purchase from. It can be hard to choose a mattress when you have so much choice. Fortunately, plenty of these mattress companies are also very affordable – you don’t have to spend thousands of dollars if you want to access a luxury mattress. King Koil is one of the major players in the game, they’ve been around much longer than many of the recent entrants. The company used to be called US Bedding – it was actually started in 1898! The company has plenty of experience at making high-end, luxury mattresses for their customers. Over the years, the company transformed from a spring mattress manufacturer to a firm that produces a wide variety of specialty mattresses. There are tons of great mattress lines to choose from at King Koil, many of them can also be customized to suit your comfort and support preferences. For the purpose of this review, we’ll be taking a look at one of the most popular King Koil mattresses on the market – the World Luxury collection. If you think you’d like to purchase one of these mattresses, this review will be the perfect resource for you and your partner. Make sure to read through all the available information below! Should I Buy the King Koil Mattress? The construction of a mattress that you’re purchasing is one of the most important components of any mattress buying decision. If you want to be certain you understand what you’re purchasing, it’s important to understand how it’s made. 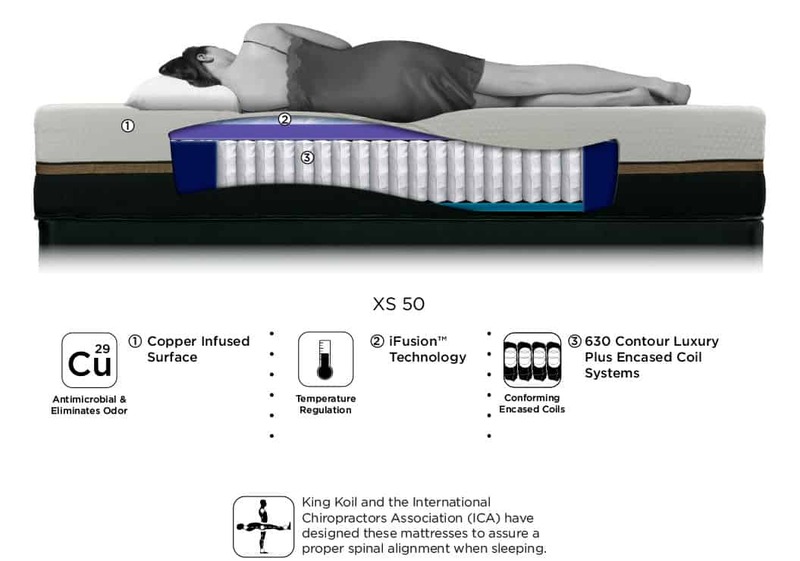 King Koil uses a variety of components to form this mattress, including coils, fibers, and latex. If you’re someone who wants to purchase a mattress that uses advanced materials to build a solid sleeping experience, King Koil is a good option. In this section of our review, we’ll examine how the mattress is made to give you a deeper understanding of the World Luxury mattress line. The World Luxury line actually has eight different mattress types – all suit different tastes in terms of softness and support. They’re all built similar ways, they just used different amounts of materials or pillow tops to achieve different goals. We’ll be looking at the Ambrose Firm edition of the World Luxury Mattress from King Koil in this section. This layer of the mattress is designed to provide you with comfort and lumbar support. It’s made from a relatively thin layer of latex. This is the layer of the mattress that your body interacts with the most – it’s responsible for the comfort you feel when you sleep on it. The latex provides plenty of bounce and is much more breathable than traditional memory foam. The bottom layer of the mattress is made from an encased coil system – the proprietary name is the 858 Contour Elite Encased Coil System. This system provides the support for the mattress and also allows for it to breathe. 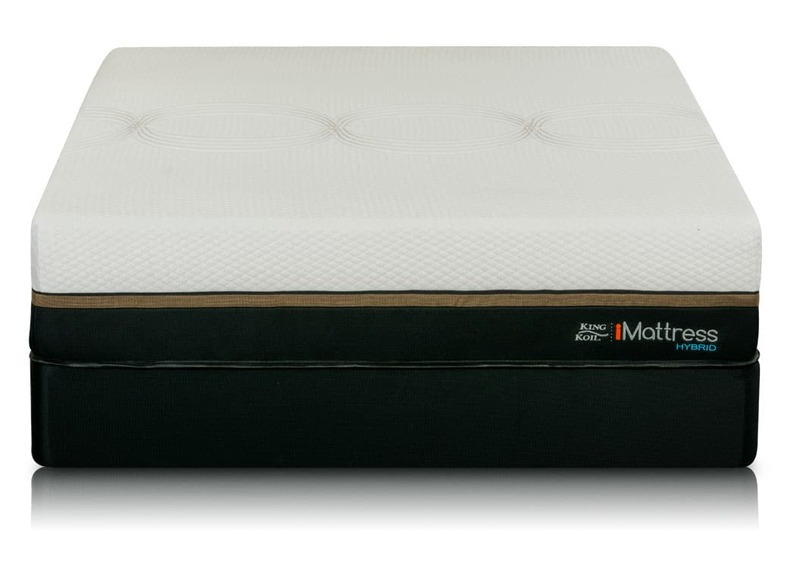 The airgaps between the coils allow for much more breathability than a regular foam mattress. Around the sides of the mattress there is another layer of material that is in place to provide edge support and keep the mattresses shape. This layer is made from a thin layer ‘Excellent Edge’ foam. It’s the perfect addition for those who want to ensure plenty of edge support! You should never overlook the mattress cover when you’re purchasing a new mattress. If you purchase a mattress with a bad cover, you might be risking potential damage to your mattress. In addition, the mattress cover might mess with the comfort of the mattress by providing too much extra cushion. Some mattresses also create issues for people who want to avoid heat retention while they sleep. If a mattress is to weighty, it will trap heat and result in you not being able to enjoy a good night’s rest. The cover of the World Luxury collection mattress at King Koil is made from Tencel Fibers. These fibers provide breathability, comfort, and protection for the rest of the mattress. It’s always important to assess how much support and comfort the mattress offers to customers. The Ambrose Mattress from King Koil has plenty of support for those who need a firm mattress – this is one of the firmer editions of the mattress. In terms of firmness, it comes in around a 7.5-8/10 on our scale. Keep in mind there are other World Luxury editions that have different firmness levels. The Montpellier Mattress has just a 3/10 on the firmness scale. In terms of comfort, the Ambrose Mattress does the trick. Because the mattress is firmer than other editions, it’s not the most comfortable mattress available. Regardless, the latex top layer provides contour around your body as you sleep. Breathability within the Ambrose mattress is extremely good – you won’t have to worry about overheating. All the materials in the mattress are in place to provide you with a cool sleeping experience. 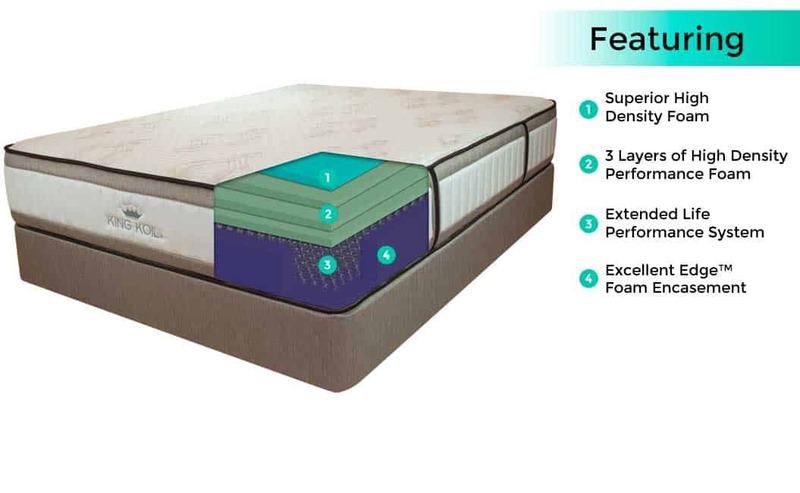 If you’re someone who often overheats when you sleep, the coil system in this mattress will ensure your temperature stays regulated throughout the night! The mattress is also certified by the International Chiropractors Association (ICA) – meaning it provides proper spinal sleeping posture for those who sleep on it. This is great if your someone who experiences back problems. King Koil has undergone a lot of changes over the years. As a company that is around 120 years old, the firm understands the importance of keeping with the times. Their original specialty was providing spring mattresses for their customers. As foam and coils began to be introduced into the industry, King Koil follows suit. The World Luxury collection has not undergone any significant changes, but there have been plenty of new mattress lines released over the past few decades. This is definitely a company that is always evolving. Price is also a vital component to consider when you purchase a new mattress. If you think a mattress is out of your price range, you should probably consider alternatives. The benefit is that you have so many different manufacturing companies at your disposal in modern times – if a price isn’t right, you don’t have to look far for an affordable mattress. At King Koil, the World Luxury Mattress is very reasonably priced, but it still might be out of some people’s price range. All of their mattresses come in at less than $1,000. Below is a chart with the various mattress sizes and their prices. If you haven’t purchased a mattress in a long time, you might be wondering what other things you need to consider when purchasing a new one. Most people focus on the price and how the mattress feels, but they don’t focus on what else is included with the mattress – this is a big mistake. The additional benefits and features that you’re afforded through a manufacturer are some of the most important components of any decision-making process. They can make a mattress much more valuable. This is the most important component of any additional benefit that you receive with a mattress. If you’re going to be investing hundreds of dollars in a mattress, you need to be certain that it will last a long time. The one way you can guarantee this is to have a solid warranty that backs the mattress up – it’s nice to know that you have a way to ensure you won’t bear the cost of any problem with the mattress. At King Koil, you’ll receive a 10-year warranty for the mattress. If anything is to go wrong do to a manufacturing fault, you’ll receive a replacement mattress for your faulty one. This means that you can rest easy for the next decade knowing that your mattress is covered by a solid warranty. This is in line with industry standards. King Koil is like most traditional mattress companies in that they have showrooms and stores that you can use to check out the mattresses they have on offer. If you’re someone who wants to lie on a mattress before you try it, King Koil works with a variety of retailers to make this possible. Many modern mattress companies only ship mattresses to you – they don’t have showrooms or stores for you to try the mattress out. These companies often offer money back guarantees, but it can still be annoying taking a gamble on a mattress that you’ve never been able to see. If you’re thinking of buying a King Koil, head to their website to find locations for showrooms. Many modern mattress companies provide free shipping for their mattresses. 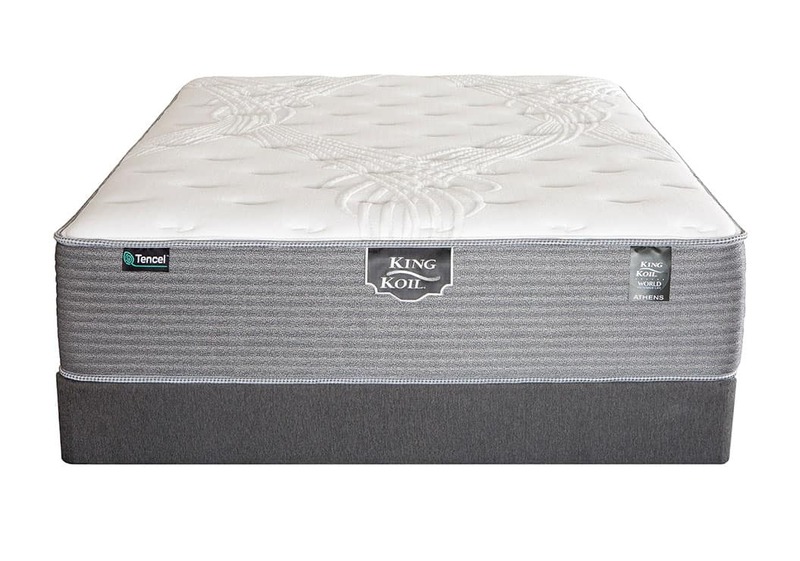 With King Koil, you have to find a retailer or store to purchase the mattress. This means that the shipping costs will be dependent on the route that you use to purchase the mattress. This often means that shipping isn’t free. You need to factor the cost of shipping into the cost of the mattress to get a full perspective on the value of the mattress. It seems like everything is made overseas these days. Over the past four decades, the manufacturing industries in America have largely been relocated to countries with much lower wages. While this often means that we have much cheaper products, it also strains the labor market in certain areas. If you’re someone who wants to support companies who value local industries and workers, King Koil is a good option. They make all of their mattresses right here in the United States – partnering with them is a great way to show you care about local jobs. As mentioned previously, many mattress companies now allow for extended trial periods for those who purchase their mattresses. If you’re someone who is looking to purchase a mattress that you can try out before you decide to keep it, you’ll need to check the return policy of individual retailers. Remember, you can head to a showroom and test the mattress before you purchase it, so this isn’t too much of a disadvantage. The last benefit we’ll discuss in relation to King Koil is the ability to purchase a range of different mattress types from the company. If this particular model isn’t your first choice, you can look at other mattresses that carry similar features and benefits. They use a range of different materials and designs to produce their various mattress lines. The World Luxury line of mattresses from King Koil offers you the ability to purchase a luxury mattress at an affordable price. With a range of different firmness levels available within this specific range, you don’t have to look elsewhere if you’re someone who is looking for a specific level of support. The mattress is also very breathable, which is great for those who oversleep. While King Koil does offer plenty of benefits and a solid warranty, some benefits will depend on the retailer you purchase through. Make sure to ask about these features before you buy one of their mattresses. If you still think you would prefer another mattress, have a look at some of the other reviews on our site. We’re a great resource for anything related to mattresses and sleeping accessories!